At Aluwind we have developed strong competences in solutions of logistics which come as an obvious extension of our production. These logistics competences enable us to deliver a higher degree of finished and complete solutions to our clients to allow them to focus on their core services and obtain a substantially more simple supply chain, optimised cash-flow and liability arrangement. • Procurement. Aluwind have specialised in procurement and disposal of components that supplement our own production programme and which complete the total solution from Aluwind. These components may be purchased via Aluwind’s own supplier portfolio, or they may be purchased and disposed in cooperation with our clients and their preferred component suppliers. • Kitting. 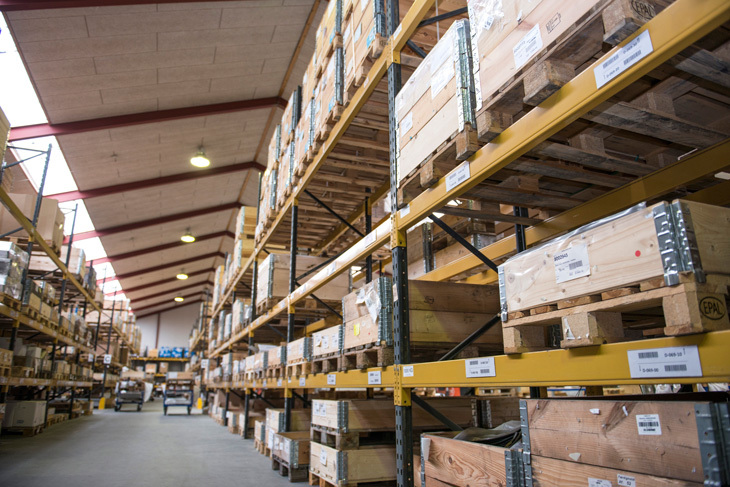 Aluwind have supply centres that handle the overall logistics operation, including self-constructed parts and purchased parts, quality control, stocking, picking and packaging according to agreed specifications. Our Supply Centres are managed by the most up-to-date technology, including bar-code based parts identification and warehouse management systems. • On-site mounting. Aluwind even offer our clients to mount our production and solutions at their location. Hereby the total solution is reached and Aluwind assume responsibility for the entire value chain from production/procurement to mounting at the client’s location.